"...This is our first newly built home and I never thought we would find something we would love with as much character as our previous 1920s bungalow. Not only is our new home our dream home, the process from start to end (and even post-closing) has been easy and efficient. Patrick has been accommodating and courteous through it all..."
"I had an extraordinary home buying experience with Patrick and Cloud IX Homes. As a Real Estate Professional, it is unusual to have such a pleasant experience when a client selects a home that is 'to be built'. The transaction with Cloud IX felt more like a collaborative process between Patrick and my Purchasers than a typical new home purchase. Everyone involved was professional, accessible and ready to answer any questions or requests. Patrick himself was personally involved every step of the way offering advice and insight. The icing on the cake is that while all Cloud IX homes have exceptional 'curb appeal', they are also gorgeous inside and built of high quality materials. The attention to detail and level of personal attention is uncommon. There is no question that I will be leading future buyers to Patrick Ohlhorst and Cloud IX Homes." "With every turn into a room there is an element of design surprise that just delights us and gets noticed by our guests. Our Cloud IX home is so thoughtfully laid out with the latest in design style and planning. Our Cloud IX Home is right out of a magazine. We delight in being in our home - it is quite simply special. Thank you Patrick!" 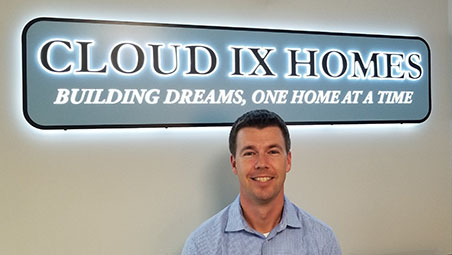 "After looking at nearly 100 houses, we knew we walked into something special when we toured our Cloud IX Home for the first time. Patrick got every detail just right and included design elements that made this house stand out in a thoughtful and tasteful way above any others we viewed. Details such as a fully finished lower-level, heated bathroom floors, beautiful kitchen with white marble, walk-in pantry, kitchen banquet, coffered ceilings.... this home is an entertainers dream and I'm proud to bring our friends and family here. I know future buyers will be pleased with the charm of a Cloud IX Home, we are! " "Patrick has been a pleasure to work with on building our new home. With Cloud IX Homes, I can trust that things will be done with quality and craftsmanship. Easy to communicate our needs and desires to Patrick. He listens and executes with professionalism. Seeing the house come together has been a dream come true! Cloud IX has built us a home of value and quality. "